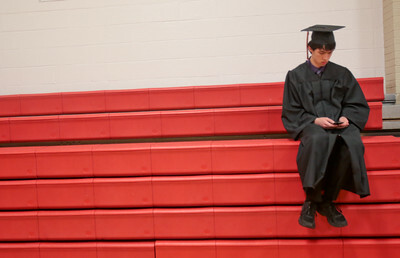 Michelle LaVigne/ For Shaw Media Nevada Perry of McHenry checks his phone before lining up for the McHenry High School-East Campus' Commencement in McHenry on Thursday, May 21, 2015. Michelle LaVigne/ For Shaw Media (Closest right,) Quinton Pilat of McHenry visits with Tom Schaade of McHenry (left,) while (background left to right,) Joe Tullar of McHenry, Andy Perez of Island Lake and Nathan Sell of Lakemoor all wait to line up for the McHenry High School-East Campus' Commencement in McHenry on Thursday, May 21, 2015. 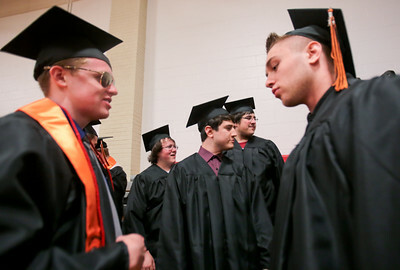 Michelle LaVigne/ For Shaw Media The graduating seniors of McHenry-East High School walk towards McCracken Field in-between the row of District 156 faculty members during McHenry High School-East Campus' Commencement in McHenry on Thursday, May 21, 2015. 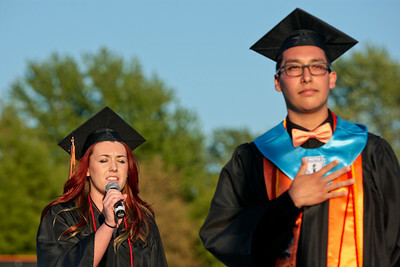 Michelle LaVigne/ For Shaw Media Jesus Varela stands by after giving the Pledge of Allegiance while Katelynn McManus sings the National Anthem during the McHenry High School-East Campus Commencement in McHenry on Thursday, May 21, 2015. 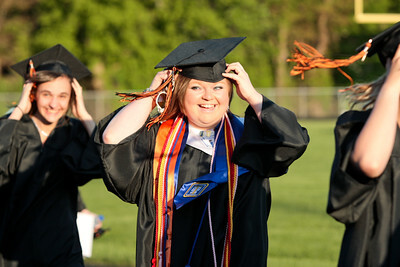 Michelle LaVigne/ For Shaw Media Abigail Wojcik secures her cap as she heads to her seat during McHenry High School-East Campus' Commencement in McHenry on Thursday, May 21, 2015. 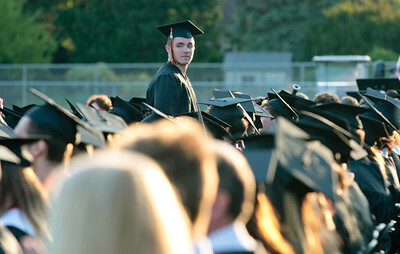 Michelle LaVigne/ For Shaw Media Collin Palmer stands to be recognized as an enlisted member of the military during the McHenry High School-East Campus Commencement in McHenry on Thursday, May 21, 2015. 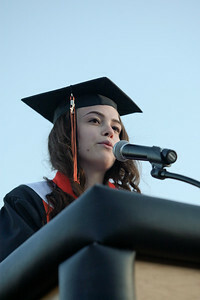 Michelle LaVigne/ For Shaw Media Class president Rebecca Lameka delivers her speech during the McHenry High School-East Campus Commencement in McHenry on Thursday, May 21, 2015. 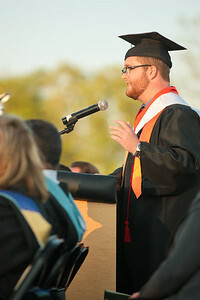 Michelle LaVigne/ For Shaw Media Matthew Korus delivers the Honors Address during the McHenry High School-East Campus Commencement in McHenry on Thursday, May 21, 2015. 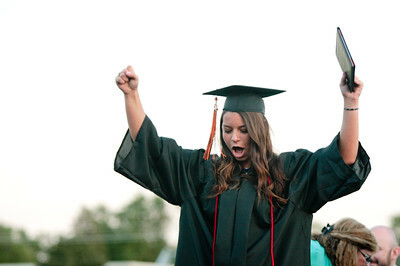 Michelle LaVigne/ For Shaw Media Nikki Taylor Zenner, the final graduate to accept her diploma, celebrates while exiting the stage during the McHenry High School-East Campus Commencement in McHenry on Thursday, May 21, 2015. 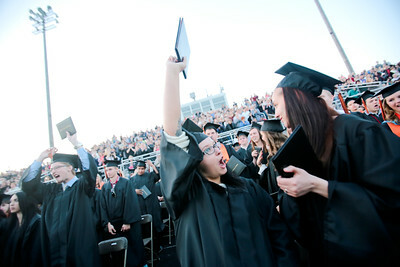 Michelle LaVigne/ For Shaw Media Megan Mae Brackenfield (right,) watches as Casey Lynn Bracken gives a victory cheer after the McHenry High School-East Campus Commencement in McHenry on Thursday, May 21, 2015. 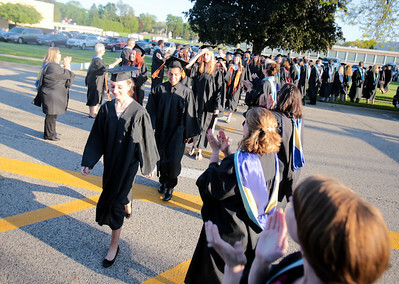 The graduating seniors of McHenry-East High School walk towards McCracken Field in-between the row of District 156 faculty members during McHenry High School-East Campus' Commencement in McHenry on Thursday, May 21, 2015.